Inspirational quotes make me shudder. 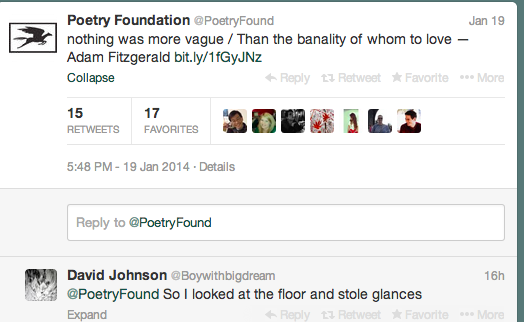 In fact, I don’t much like seeing poetry quoted at all. 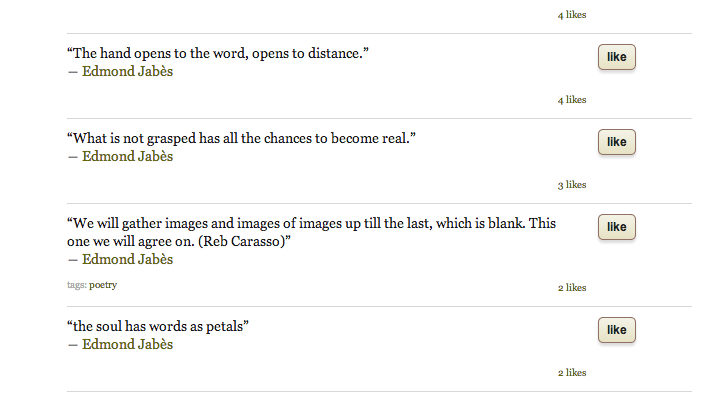 When I google a poem I suffer irrational irritation with sites like Brainy Quote, Notable Quotes, even Goodreads. Nothing neuters feeling like a like button. Likewise, lines of of poetry that turn aphorism are inevitable, and not all bad. And yet – is nothing lost here? Quotation creates kitsch. It creates sentimentality. Quotation is Hallmark and that modern superstition, “inspiration.” It’s the abuse of so many cynics’ words on refrigerator magnets. It’s the decorative and commercial power of sentiment, all the quote-emblazoned merch at the front of the bookstore to make the bookworms squirm when they buy a moleskine. It’s pinterest boards of beribboned words, those senior yearbook pages come to life. Quotation is the kitsch technique par excellence because it naturally invites meaningless repetition, and the internet enables it. This is snobbery, of course. Quotation threatens authority. Ripped from their context, lines of poetry become bite-size and accessible – for amateurs or poseurs. It turns on the question of use. Jed Rasula has delineated an ontological category of poetry “for use rather than for consideration.” In discussion with Mike Chasar in The Boston Review, Rasula thought we could distinguish “a world of poetry, avidly consumed and circulated on the one hand, and a ‘poetry world’ on the other hand… with its anthologies, prizes, fellowships, endorsements.” Poetry as used has a separate life, that need not overlap with what the snobs think. Chasar’s research on popular poetry consumption for his book Everyday Reader turned up the 1930s poetry scrapbook of a woman named Doris Ashley. She had pasted Ezra Pound’s minimalist miracle “In a Station of the Metro” (“The apparition of these faces in the crowd; petals on a wet, black, bough”) but the whole thing turns out, on quick inspection, to be a page of poems, high and low, about trees. It’s made trivial in context, but who are we to deny Doris her enjoyment of the line? So we could see tweeting or reposting lines of poems as an unassailable use of poetry and dismiss any cringing at it as elitist. But it can’t only be elitism that generates discomfort with quotation, paints it corny, even insidious. A mildly experimental concept of poetry would of course embrace the kitschy use of poetry, the fleeting poetic moment of quotation, instead of fetishizing the poem as a monument to be regarded whole or not at all. Modernity is the long lifespan of the collage form, of decontextualized images from Dada to advertising motif to child’s game to our daily experience of the internet. Of course this internet is also raw material for poems, not merely the stage for their afterlife, and transformation into kitsch. Any honest modern poet has to acknowledge their material comes at them in blips and snatches, in green and blue bubbles and in an endless, unfolding scroll of words and images. The simultaneous existence of poetry on the Internet as source and product is therefore its new ontology. What happens when everything is inevitably and immediately pastiche? 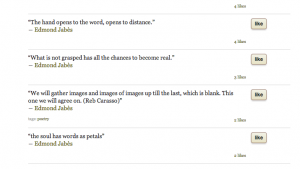 Quotation has long been an essential technique for all types of writers– folios of quotes organized by topic were not called upon for easy sentiment, but were a real way of collating thought. Walter Benjamin’s Arcade’s Project, on Paris, may have begun as such, but it became a book of quotation as both process and performance. The “lightning flash” or “blink” of cognition that comes with citation, Benjamin argued, mimics the modern archetype of the flâneur, flitting through the aesthetic onslaught of modernity with ease and perspicacity. Citation would lead to the “cracking open of natural teleology,” in which Benjamin’s research, his clippings, his inspiration, became the work of art: “Knowledge comes only in lightning flashes. The text is the long roll of thunder that follows.” A descendant of Benjamin’s flâneur, the cyberflaneur, found his way to happier theories of the web early on its existence. Against Benjamin’s hope for enlightenment out of the collage of experience, he feared the violence of surrealism, with its lack of context, embrace of the id, and abdication of responsibility for the images it created. 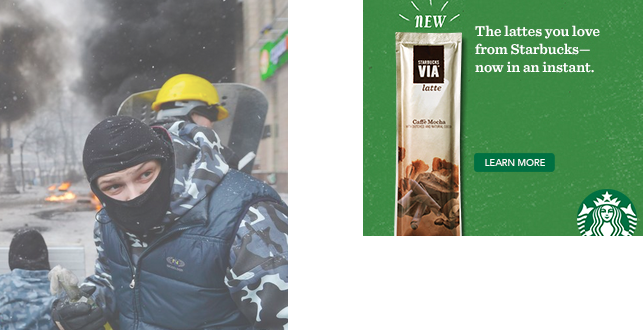 Our daily media onslaught is that, is Ukraine and instant coffee, via™ and VIVA!, served up to us by the online ad action algorithms we cannot see, and whose presence in our aesthetic life we’ve come to accept as the price of its content. The life of word and images on the internet, their mutations and collective ownership, has something of that abdication too. Thus, there’s an ethical dimension to kitsch and quotation. 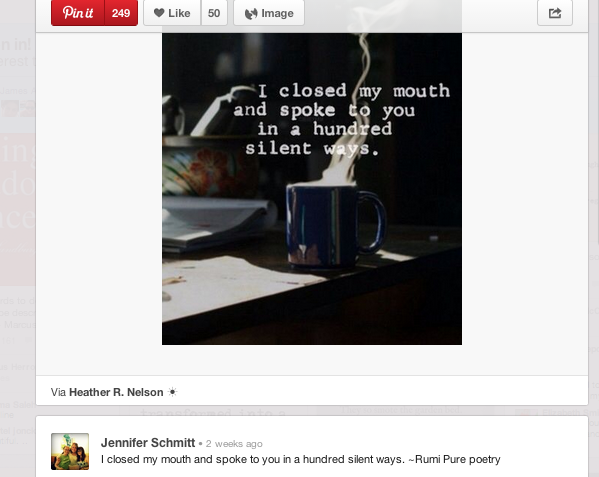 Poets have lines inside them as mantras. Distinguishing between a Dada collage and Doris’ scrapbook, or between the Poetry Society tweeting famous lines, or someone culling tweets and calling it poetry, is a matter of applying thinking of “for use” outside the high/low dichotomy. Wendell Berry likewise demands we “stand by words,” and take care with “the accountability of language.” Like, Merrill he reflects the ethics of language: the connection between the speaker and the words he has put there. We might find Berry’s poems old-fashioned, but the epitaph (poetic quotation!) to his essay, “standing by words” of Dante’s “He said, and stood…” is a political concern, not a retrograde gatekeeper’s impulse. That’s the threat posed by a concept of poetry that jettisons the integral poem for its transitory performance, for the irony of its appropriation. Quotation risks stripping words of a stance, of presenting them for insipid or mercenary or even useless use. Such use is not synonymous with popular. Context-free words and imagery is the defining aesthetic of modernity; the struggle is to stop losing context from meaning losing thought.